To Cite: Khodaie F, Khazaei-Poul Y, Moini-Zanjani T. Anti-Proliferative Effects of Piroxicam and Nimesulide on A431 Human Squamous Carcinoma Cell Line, Int J Cancer Manag. 2017 ; 10(4):e7565. doi: 10.5812/ijcm.7565. Background: Skin cancer is one of the most common types of cancer worldwide and non-steroidal anti-inflammatory drugs (NSAIDs) have been proposed for prevention and treatment of a variety of cancers. Objectives: In this study we aimed to evaluate the cytotoxic effects of piroxicam (a non-selective cyclooxygenase (COX) inhibitor) and nimesulide (a highly selective COX-2 inhibitor) on A431 human squamous carcinoma cell line. Methods: Squamous carcinoma cell line (A431) was cultured in RPMI medium containing 10% FBS and penicillin-streptomycin at 37°C and 5% CO2. Cells were treated with different concentrations of piroxicam and nimesulide (100 - 1000 µmol/L) for 24, 48 and 72 hours (h). Anti-proliferative effects were determined using MTT colorimetric assay. Results: Piroxicam and nimesulide reduced cell viability in a time and concentration dependent manner. The most cytotoxic effect was produced in 72 hours incubation time. The IC50 value of nimesulide was significantly lower than piroxicam in 24 and 72 hours, but not in 48 hours treatment duration. Conclusions: This study demonstrates that the administration of a highly selective COX-2 inhibitor could probably be more effective than a non-selective NSAID in reducing cancer cells proliferation and that COX-2 can possibly play an important role in skin cancer development. Skin cancer is one of the most common types of cancer worldwide and squamous cell carcinoma (SCC) is the second most common form of skin cancer after basal cell carcinoma (BCC) (1-3). Treatments used for SCC include surgical excision, topical and systemic chemotherapy (4). Some chemotherapeutic agents have been used to treat SCC such as cisplatin, doxorubicin, 5-fluorouracil, vincristine and bleomycin. Unfortunately, these drugs target all cells with high proliferation rate in the body like bone marrow and hair follicles and cause many significant side effects (5). Other drugs have been demonstrated to have anti-proliferative properties in cancer cells in addition to their conventional therapeutic effects including some antibiotics like doxycycline and ciprofloxacin, some herbal extracts and non-steroidal anti-inflammatory drugs (NSAIDs) (6-10). Chronic exposure to ultraviolet B (UVB) radiation is a recognized etiology for skin cancer, one possible mechanism is thought to be through an increase in the production of prostaglandins (PGs) in the keratinocytes in response to UVB irradiation (11). Prostaglandins are synthesized from arachidonic acid by cyclooxygenase (COX) enzyme. Cyclooxygenase has two isoforms: cyclooxygenase 1 (COX-1) which has an important role in homeostasis, and cyclooxygenase 2 (COX-2) which is induced by inflammatory mediators (12). NSAIDs inhibit COX enzyme and numerous studies have demonstrated their anti-proliferative effects on various cancer cell lines (13-19). Their mechanism of action is not well understood but COX dependent and independent pathways have been suggested to have an important role in tumor genesis (20). Piroxicam is a non-selective COX inhibitor and its anti-proliferative effects on human breast, lung, urinary bladder, skin melanoma and colon cancer cell lines have been investigated (13-17). On the other hand, nimesulide is a highly selective COX-2 inhibitor and its cytotoxic effects have been evaluated in some cancer cell lines such as head and neck squamous cell carcinoma, colon carcinoma and pancreatic cancer (21-23). Based on this background, the aim of the present study was to evaluate the anti-proliferative effects of piroxicam and nimesulide on human squamous carcinoma cell line A431and to compare the effectiveness of a non-selective with a highly selective COX-2 inhibitor on this cancer cell line. Piroxicam, nimesulide and MTT (3-(4, 5-dimethylthiazol-2-yl)-2, 5-diphenyltetrazolium bromide) tetrazolium were obtained from Sigma-Aldrich (St. Louis, MO, USA). Dimethyl sulfoxide (DMSO), penicillin-streptomycin and trypan blue were purchased from Merck (Darmstadt, Germany). Heat inactivated fetal bovine serum (FBS), RPMI 1640, trypsin-ethylenediaminetetraacetic acid (trypsin-EDTA) and phosphate buffered saline (PBS) were provided from Gibco (New York, USA). The human squamous carcinoma cell line A431 (Pasteur Institute, Tehran, Iran) was cultured in RPMI 1640 medium containing 10% FBS, 100 U/mL penicillin and 100 μg/mL streptomycin in a humidified and 5% CO2 incubator at 37°C. Cell density was monitored by an inverted microscope until approximately 80% of confluency was attained. Then the cells were trypsinized and centrifuged at 1500 rpm for 10 minutes. Cell count and viability were assessed using the trypan blue staining assay. Cells stained with trypan blue (0.5% in NaCl) were transferred to the Neubauer chamber and counted by light microscope. Cell viability was calculated as approximately 98% (dark blue colored cells were defined as dead cells). The anti-proliferative effects of piroxicam and nimesulide were evaluated using the MTT assay (24). For this purpose, 5 × 103 cells per well were seeded in triplicate in a 96-well plate containing 200 µL of complete tissue culture medium (CTCM) and were incubated for 24 hours (h) prior to treatment. The drugs were dissolved in 100% DMSO as stock solution and then diluted with RPMI medium with the final DMSO concentration of 0.25%. Drug solutions were prepared freshly before the test. The A431 cells were treated with different concentrations (100, 250, 500, 750 and 1000 μM/L) of piroxicam and nimesulide for 24, 48 and 72 hours. Cells treated with drug vehicle (DMSO 0.25%) served as control. To determine the DMSO cytotoxicity, a control group containing only CTCM was added. After incubation, cells were washed with PBS and then incubated with 100 μL of MTT (5 mg/mL dissolved in PBS) at 37°C for 4 hours. The viable cells metabolized MTT to formazan crystals and after dissolving the crystals in DMSO, the plates were read in an absorbance reader (ELx800, BioTek, Winooski, VT, USA) at 590 nm. The concentration of drug needed to reduce proliferation of cancer cells by 50% was determined as inhibitory concentration 50 (IC50). Data were analyzed using GraphPad Prism software (version 6) and Microsoft Excel (2013). Data were expressed as mean ± SEM within 95% confidence intervals. Determination of IC50 values were performed using nonlinear regression analysis. The mean differences were compared by the analysis of variance (ANOVA) and P value < 0.05 was considered significant. Cytotoxic effects of piroxicam and nimesulide on A431 squamous carcinoma cells were determined using MTT colorimetric assay as described above. Cell viability was considered as 100% in controls to compare the cytotoxicity effects of treatment groups. Since there was no significant difference between DMSO with CTCM containing controls, treatment groups were compared to 0.25% DMSO control. 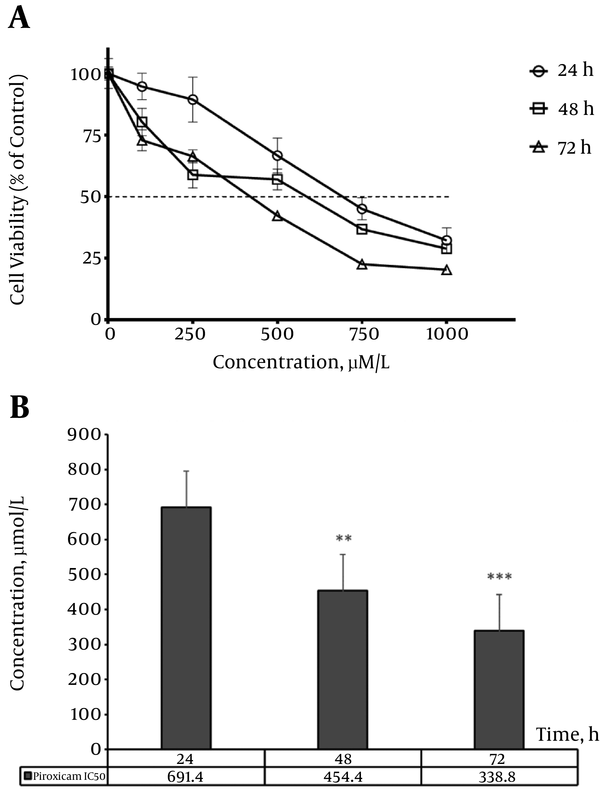 Piroxicam caused a decrease in cell proliferation in a time (24, 48 and 72 hours), and concentration (100 - 1000 µM/L) dependent manner (Figure 1A). A significant reduction in cell viability was observed from 500 µM/L of piroxicam in 24 hours treatment (P < 0.05); however, in 48 and 72 hours treatment, the concentration of 100 µM/L of drug caused significant cytotoxic effects (P < 0.05 and P < 0.001, respectively). 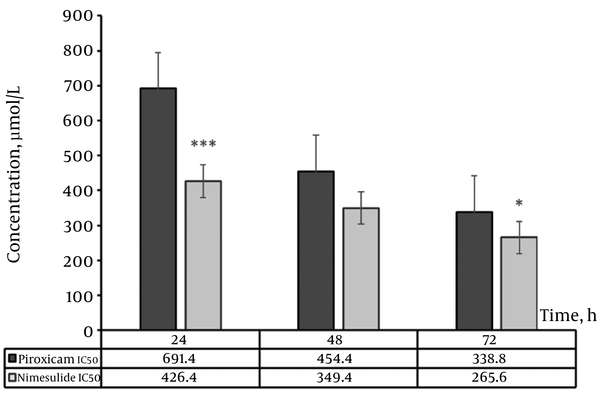 Figure 1B shows the comparison of piroxicam IC50 values at different time points in cell proliferation assay, which demonstrates a significant decrease in IC50 values after 48 and 72 hours compared to 24 hours piroxicam treatment (P < 0.01 and P < 0.001, respectively). Besides, IC50 value was significantly lower in 72 hours than 48 hours treatment (P < 0.05). In contrast to piroxicam, the minimum concentration of nimesulide which significantly decreased A431 cell proliferation was 250 µM/L in 24, 48 and 72 hours treatment (P < 0.001) (Figure 2A). Figure 2B shows the IC50 values of nimesulide in different time points. In 72 hours, the IC50 value was lower compared to 24 and 48 hours treatment (P < 0.001 and P < 0.05, respectively). However, there was no significant difference between the IC50 value of 48 hours compared to 24 hours treatment assay (P > 0.05). The comparison of IC50 values between piroxicam and nimesulide is shown in Figure 3. The IC50 value of nimesulide is significantly lower than piroxicam at 24 and 72 hours (P < 0.001 and P < 0.05, respectively), but not at 48 h treatment duration (P > 0.05). Non-melanoma skin cancers (NMSCs) are among the most common types of cancers worldwide, and its increasing incidence has become a main concern. In the present study, we evaluated the cytotoxic effects of piroxicam (a non-selective COX inhibitor) in comparison to nimesulide (a highly selective COX-2 inhibitor) on human SCC cell line A431. Our findings reveal that both drugs have cytotoxic effects on A431 cells and reduce cell viability in a time and concentration dependent manner. Increased UV radiation intensity due to atmospheric ozone depletion which induces an inflammatory response is considered to be a major risk factor in the pathogenesis of skin cancer (25). COX enzyme is known to be involved in some inflammatory diseases including cancer and evidence shows a high level of PGs in tumors (26). Increased expression of COX-1 has been observed in breast, prostate and cervical cancers (27-29), and also, induction of COX-2 enzyme and its dependent increase of prostaglandin synthesis are regarded to be important in the regulation of inflammation which is observed in cancer diseases (30). Previous studies on SCC cell lines demonstrated a variable expression of COX-1 and COX-2 in these cells (31); therefore, involvement of COX-1 and inducible COX-2 enzyme in tumor growth has become a main target for cancer prevention and treatment (32). Over the last fifty years, it was demonstrated that NSAIDs were used for treatment of cancer (33, 34). Conventional NSAIDs inhibit both COX-1 and COX-2 enzymatic activity, but, in order to reduce the side effects associated with the inhibition of homeostatic PGs by COX-1, some specific COX-2 selective inhibitors have been developed. Although the mechanisms of action of anti-inflammatory agents as adjuvants in cancer treatment are not fully understood, some studies have shown that apoptosis could be one of anti-tumor mechanisms of NSAIDs (23). Moreover, in vitro studies have reported that over expression of COX-2 which has been found in SCC could inhibit apoptosis (35, 36). Many studies have shown that long term use of NSAIDs decreases the risk of adenomatous polyps, colorectal, breast, lung and bladder cancers (37, 38). The role of NSAIDs in prevention and treatment of multiple cancers has been investigated, but data about effectiveness of NSAIDs on NMSCs are limited. In a study by Tang et al. it was shown that celecoxib (a selective COX-2 inhibitor) decreased BCC tumor development in mice and humans (39). In another study, Agarwal et al. 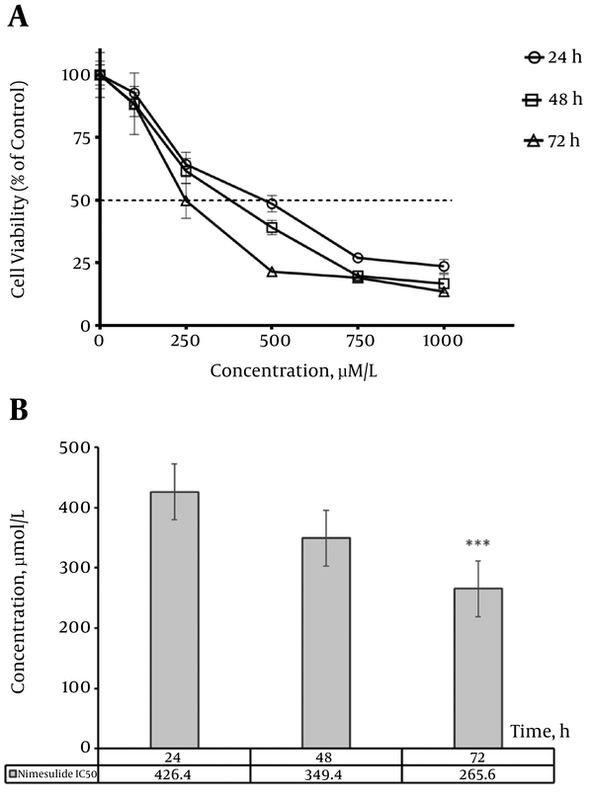 found a 50% decrease in A431 cell viability at a concentration of 60 µM/L of celecoxib (40). Arumugam et al. reported that treatment with diclofenac (a non-selective COX inhibitor) inhibited the growth of A431 xenograft tumors in murine model (41). Cheng et al. determined the 24 hours IC50 values of sulindac and phospho-sulindac in A431 cells at 2210 and 60.4 µM, respectively (42). In a research conducted by Kim et al. administration of 30 µM/L piroxicam had no effect on cell growth in A431 cells for 72 hours (18); however, in our study, a significant reduction in cell proliferation with the minimum concentration of piroxicam (100 µM/L) was observed after 72 hours treatment. On the other hand, Pelzmann et al. found that nimesulide effectively reduced proliferation of head and neck squamous cell carcinoma compared to indomethacin (21). In our research, we found that the IC50 value of nimesulide was significantly lower than piroxicam in 24 and 72 hours treatment. It appears that the most effective condition in inhibiting cell survival was detected after 72 hours treatment with piroxicam and nimesulide at 338.8 and 265.6 µM/L concentrations, respectively. In this regard, our findings are consistent with the previous mentioned studies. In conclusion, regarding the anti-proliferative effects of NSAIDs on cancer cell lines, and our results concerning the cytotoxic effects of piroxicam and nimesulide on A431 cell line, it seems that the administration of a highly selective COX-2 inhibitor could probably be more effective than a non-selective NSAID in reducing cancer cells proliferation and that COX-2 can possibly play an important role in skin cancer development. This result can be applied to adjuvant therapy in skin cancers. This article has been extracted from the thesis written by Faezeh Khodaie (registration No. : 254). We would like to thank the pharmacology department’s staff for their support in conducting this study. Conflict of Interest: Authors declare no conflict of interest related to the material in the manuscript.